Sun Light, the Feeling of Sand, Gentle Winds, The Cycle of Nature and life, Water. "Lesser Beings", Maleficium (Dark Arts) users, Meat, Rude and Disrespectful Beings/Spirits. 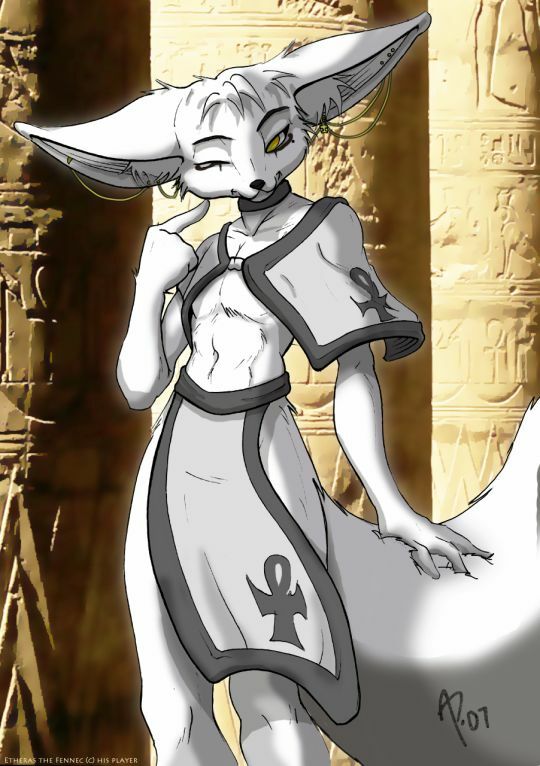 Yukino, born and raised in the Provence of Arvalos with in the City's Temple Grounds is a male anthropomorphic Vulpes zerda (Fennec Fox) with an Androgynous Face but male physique, his fur is a complete snow white color from head to tail, like his brothers and sisters Yukino was born Blind, a type of disability not only related to his lineage but a side effect of the ability's he and his lineage are born with, despite being born physically blind, Yukino can see and Navigate as if he were not, this is mostly in part due to Clairvoyance and the ability to communicate with Spirits. Yukino is the last remaining member of his family of 6, due to the notion that 'he merely just outlived them all', its also noted that his species in particular has relatively shot life span of up to 10-14 years, the fact hes lived more then twice as long is a miracle in its own regard and could quite easily have him considered as being "ancient" to his own kind, how ever despite his old age for his kind it does not falter his physical condition, ability's nor mind, this is a particularly valuable milestone and trait for Yukino who belongs to one of few that possess an abnormal amount of spiritual energy due to not only a natural connection to the Spirits but in general just possessing a Strong Soul and Will, something that might take years for one to achieve though training and meditation, by possessing a strong soul the user, in this case Yukino possess's a large amount of Spirit Energy, enough that he can Weave it into a wide array of ability's and skills, this does mean that his Spiritual Energy is also a greater weakness simply because he is exposing his Soul to external force's when ever its being weaved and channeled. Despite the vulnerability Risk's involved in Channeling his own Spirit, Life energy in other words, there are several other risks involved regarding its use, if too much energy is used it can render injury upon his body or even cause his own death, in order to avoid this Yukino try's to remain focused at all times though prefers to channel his own Spirit as a last resort should he be required to do so after first calling restless spirits should they answer his call, to his aid for a means of assistance, despite those very same spirits posing a very severe risk them selves. Yukino serves the Temple as a Mystic and as a Shaman, its suspected that his prolonged life is due to the Spirit Springs which he and others had watched over and Maintain, his Day to day duty's ensure that that there is always something to be done, if not in his immediate vicinity then somewhere else, he is able to ascertain such knowledge by entering a special state of mind and expanding his awareness or be seeing into possible near futures should visions appear before him, though this he is able to guide others to where they are needed or provide advice to those who seek out his counsel, in some instance's he is able to sense when reality its self is being forced to change or the balance of nature is out of place. He is also seen differently when viewed by different powers, those who can sense and see life essence or KI might see a rather strong and larger glow around Yukino while those who can see and sense spirits might sense a Strong soul surrounded by many smaller wisp, and those with power sensing skills might sense nothing at all. Yukino has Piercings attached to thin Gold chains linked together along his ears, they are designed in a way that should they be caught on and pulled by something the chains break, he also wear's a Snow white garb made of cloth, aside from its white coloring matching his own pale snow fur, it features the image of an Ankh upon the left shoulder and garb front. Communicating and Guiding Spirits, Being of Assisting, Dealing with the Dead, skilled at paw-to-paw combat, Effective against Weaker Spirits/Soul's, can target the soul with out physically damaging the body or mind. Doesn't get along with the living all too well, may indirectly cause harm if having to physically fight, can summon Spirits that cause havoc instead of helping, Highly Vulnerable against Spirit/Soul ability's, can become overwhelmed by flaws of his own ability's, generally requires some level of focus to maintain ability's. Yukino is Physically Blind and rely's on his Clairvoyance in order too see and navigate as normal. Yukino can gain direct visual information about an object, person, location or physical event through means other than the user's physical sight and allows them to act when they are unable to use their eyes, Yukino uses this ability to see. Yukino has the ability to surround himself in spiritual energy, allowing him to use various offensive/defensive powers, it is a Technique of Spiritual Force Manipulation. User has a strong soul that is equivalent to the power of many souls which comes in handy in situations that tests one's spiritual fortitude and grants spiritual abilities. The user's soul is unable to be bound by anything and lives free without anything holding it back. The user sense the presence and location of ki; the circulating life force whose existence and properties are the basis of much Chinese philosophy and medicine. The user can sense the overall well-being and conditions of their immediate environment and natural setting stemming from a psychic sensitivity to nature, including all biomes (forests, deserts, tundras, wetlands, mountains, etc). They are physically, emotionally, and/or mentally in sync with environment, which allows them to perceive and understand not only what happens in nature but if it is in harmony with natural order. A naturally tree falling or predator catching their prey in a nearby forest would be felt by the user, leaving them feeling calmly relieved. Unnaturally, would leave the user sickened. The user can sense and become aware whenever reality is altered by Reality Warping. This allows them to be aware, even if they themselves are not there. No matter where the user is, they will know when a reality warper has changed reality, This ability should not be confused with Reality Perception. Reality Perception can detect reality changes, but also any truth, This ability, however, only allows one to know when a reality warper manipulates reality. Yukino can create, shape and manipulate his own spiritual power, which is generated by every sentient being that possesses a soul, or in places with powerful spiritual influence. he is able to convert it into various forms of energy, manifest it into a solid form, or merge into existing objects. Yukino is able to generate enormous amounts of Spiritual Energy with the ability to cause crushing or repelling effects on objects or areas, can cause target to be paralyzed by the pressure, induce fear, or even kill with only their energy, while it does not effect gravity its self it can easily be mistaken as a form of gravity manipulation due to the exertion of force placed upon those with in range. Yukino can harmonize their soul with other souls, synchronizing and multiplying spiritual strength of all participants, While the effects may be temporary and limited to how many can be synchronized at once, the Short lived boost can change the outcome of a life and death situation, by cutting his own Energy, Ability's and power in half leaving him weakened, Yukino is able to Raise the ability's and condition of those he is synchronized with, how ever it takes time and focus to prepare while maintaining physical contact during channeling. By Channeling his Spiritual Energy, Yukino can release/use his Spiritual Energy/life-force in attacks of various shapes and/or intensities, either projected, used as a part of melee attacks, etc, how ever Yunkio needs to be maintain focus and control at all times as Using too much may cause him to become exhausted, wounded, or even cause death, and losing focus and/or becoming overwhelmed by feeling or emotion could cause his energy to flare and become more destructive, rendering damage or harm to other just for being near by. Yukino can summon spirits from beyond the grave in order to commune with or to serve him, how ever If a soul doesn't want to be summoned, they might resist the summoning and the Summoned souls may have a mind of their own, this ability benefits from his 'Strong Soul' and 'Soul Resonation' ability's, with out his strong soul Yukino would most certainly suffer in maintain their sanity and control the power of their altered soul and his Soul Resonation ability would allow him to harmonize with and strengthen souls that answer his calling. Yukino can perceive, contact, and bargain or control the spiritual world through shamanism, He has both ability and training/knowledge to both perceive the spirits and their effects and how to contact and manipulate them, either by bargaining, tricking, or forcing them to abide by his will. While his main ability is how to contact the spirits and how to send the spirits outside to roam the world or enter other levels of existence, By manipulating the spirit-world but he is also quite capable of being able to direct the spirits in use of their abilities and powers for his behalf in a vast variety of ways. Tricking may cause spirits to trick him back... or simply grant a wish in an inconvenient way, and Forcing could result in a spirit becoming an enemy. By entering a special State of Mind, where Yukino understands who He is and what their true purpose is. Through this he is able to Access a new set of abilities, as well as increase the strengths of current abilities. while in this Temporary State he is able to achieve outstanding feats that others are rarely capable of. an increase of intelligence, enhanced awareness, increased speed, strength, reflexes, and greater mental focus. Once settled into a special state of mind, Yukino is able to gain the ability to foresee possible futures and observe what may happen. As knowledge of the future invariably causes that future to change, visions of the future are subject to frequent shifting. While not being able to select futures or travel through time, these visions may assist in possible courses of action, Visions may be more similar to dreams, difficult to remember, or decipher and May only be able to see a certain aspect of the future, this puts great strain on Yukino's mind and may be an involuntary action happening unexpectedly. What is My way of Life? hmm... Perhaps it is to Guide all who are lost to the Peace they seek, Then again... perhaps i too seek peace and wish for a peaceful world, this i will think about." "mmm... yes? is there something else you desire of me?" "Spirits of the world, Awaken from your slumber, I call upon Thee to gather before me, Heed my Call and strive to the living world, Come, solemn spirit!" "There is none who desire to come forth, alas they have no reason to..."
"There are many things I see, I Feel, I Sense, yet not none do i See with my Eyes, I see you and all that you are just as i see everything about this world, yet i do not see you as you see me." ╠■► Played By: Dilrax Stormpaw. ╠■► Interest's: Playing With The Worlds Natural Laws, Playing with the Lives Of Others, Games And Bets. ╠■► Dislikes: To Have His Own Life And Time Played With. ╠■► Personality: Annoying, Childish, Unpredictable, Manipulative and out right Strange. Renard is a mysterious stranger who transcend existence its self, although he appears as a somewhat normal human as far as his appearance goes, he is infact a natural born kitsune and a demi-god at that too, he conceals his tail and ears with a powerful morph type ability, his origin even to him to be exact is unknown and any form of information on him is limited to due to him just appearing out of thin air, where he comes from and goes is also unknown as its almost next to impossible to follow after him, what is known is the place on which he first appeared, as if created by Time, Space and Magic itself he appeared upon the grounds of a shrine from a gateway of energy that defied the very existence of possibility. Despite what he is and what he does Renard is generally harmless on his own and can often be seen bending or twisting the natural laws of the world and reality he currently inhabits though not with out restriction, after having traveled multiple universes for some time simply because he "willed" it to be possible for him, he found a rather peculiar interest in a strange tower that much like him self's exists outside of the normal flow of Time and Space, this 'Mysterious Tower' quickly became his Domain and with it Invades new worlds offering a series of Challenges to adventurers who seek wealth, power or fame, while it is rather entertaining for Renard, there are a series of conditions and rules he himself has enforced onto the Tower and the games spread across its multiple pocket dimension rooms. it should also be known though that despite his vast arsenal of ability's and so forth... he lacks any real skill and combat power when fighting and instead may copy someone else's skills and ability's, as his own odd way of fighting cant inflict any real serious harm, rendering him to be rather weak and harmless in the end as long as he has no serious intent to destroy everything with in sight... which he is quite capable of doing, he prefers not to do so as it would mean cutting his source of entertainment short. Reynardine is bound to the Mysterious Tower and may not leave the the domains he occupies, All Rooms, The Entrance and Chamber of Fate, His Ability's and Effects only take effect upon Entering the The Tower. With all the chaos and mayhem taking place in the city of Hirano, rumors had begun to reach the ears of the city folk concerning treasure and mystery however as per usual it was nothing but frightful fancy and the talk of fools. It was during this chaos that a ghostly outline began to shimmer in the air as though it were naught but a mirage yet it's shape reached high into the skies and it's tip beyond sight. What is this strange tower? Where did it come from? Why is it here? Why did nobody notice it? With so many questions about this strange apparition, it is unknown what shall happen as so far, as none have been able to touch any solidified mass or even effect this strange apparition, but in given time as hours would pass, perhaps even days... the flow of energy resonated with various hidden elements and igniting the mist that shrouded tower from physical existence, non-corporal energy's and space bending all at once and revealing that which they kept hidden, the transparent ghostly mirage of a tower that once flickered before had now flickered into physical existence, its top ascending fading away the higher one would look but its faint edge going well beyond the clouds that would fill sky until there was nothing more to see. Large wooden doors stood tall and closed, the towers base resembling that of a old and Large stone fortress, its ghost like yet solid figure glimmering with a distorted outline upon close inspection, resonating with strange Elements that Sealed and protected the mirage tower from harm, its doors closed shut, unmoving and sealed with large rusty handles the side of soccer ball, the door two story's tall with but a single glowing Insignia looming between along the opening gap of the doors, its vertical rounded oval with two extending arrow like points resembling a sort of diamond-ish shape with a sphere held with in its center resembling an eye like image was the only identifying indication marked upon the door or even the tower its self, the mysterious tower not only just attracting mysterious force's to it but also emanated and resonated with them, as it it was not just a mere structure but something alive with energy and unknown, unimaginable secrets to be told. As if awaiting for something to happen, the Towers Door's remain shut, its Lock Turns, Awaiting its Key, its puzzle only needing to be solved and its Key Brought to its Desired Gate. Located somewhere in the Tower is a Peculiar Being who wields Unorthodox Powers beyond The Natural Laws, Known purely for his Unorthodox Methods by few who have met him in past time, this Legendary Trickster Appear's once more, Spreading the Joy of madness, Novelty items and Probability of Chance, Will you face his Twisted Power and Challenge his Game? a Game where Anything Goes and he makes the Rules, you only need to Survive in order to win, but Entertain him and you might just be granted a Boon, Fall and his Game will Claim your life. ║renard is skilled at being... a nuisance, relying on unorthodox powers, strange and rather comical ability's and the ability to simply just bend the world by mere influence and command to his will, he is not only Skilled but Dangerous in his ability to Mimic an Opponent. ║Reynardine is a non-created being with no beginning/origin at all as they were always there from the very start. This means they didn't simply create themselves nor were they created by someone else or even come into existence, rather, they have always existed in some form or another. As they have no beginning or ending of any kind, they are completely free from the control or influence of any being, even the author and grand design. ║Reynardine is immune to origin destruction or any other power that effects one's lifespan, as they have none in the same sense as natural living beings. ║User exists outside of time and space and as such are immune to just about anything that would affect or harm them: if time should stop then the user would not be affected. If reality would change, the user would remember both the previous and have knowledge of differences from the old to the new. If the area around the user explodes or the planet which they are on vanish or does not exist any more the user is not affected since they do not exist inside space. ║Renard can ignore logic/reason as if it didn't exist. Allowing him to do things without any justification or reason behind them and redefine whats normal and whats not, this lets him easily do things that are not only impossible in reality but also in fiction as well. Unlike manipulation, Reynardine isn't manipulating logic to achieve these feats, rather he is just simply ignoring internal/in-universe logic/reason and doing them anyway. ║Reynardine has the capabilities to create and assume control of concepts that aren't of a general mind-scape, in other terms, the insane, illogical and irrational to name a few. These ideas are capable of infinite diversity as there are more things alien than there are that are well known or known at all. The concepts can vary from point to point so examples can include; a irrational form of causality, probabilities that surpass one hundred percent or lower than a absolute zero, go beyond boundaries and infinite or just make them nonexistent, create infinite hierarchy of infinites and omnipotence, etc. In basic terms the user transcends all normal understanding. ║Renard can create physical laws to bend others and Reality to the boundaries of the rule. when the rules have been set, the victims have no chance of escaping them. unless the victims abide to the rules or have some means of escape, it's hopeless for them, unlike his ability to create ordinary physical laws, renard can also create unbreakable and unbendable laws that are absolute, these absolute laws are unbreakable by any means. everything is subject to them, including existence, reality, truth, logic and not, even renard him self who not only transcends above laws, rules and reality may not outright ignore and break them, he too is bound to his own absolute laws. ║Reynardine can wield bizarre weaponry with great skill. The user can also perform feats, such as bludgeoning their opponents with a book, slicing their flesh with a towel and even find effective, offensive uses for bananas and other edible objects. ║Reynardine can create, shape and manipulate pocket dimensions, small personal worlds, changing what they are as well as manipulating everything within the pocket dimension. He can also store things in that pocket dimension, not to mention manipulate the overall size of the dimension. ║Reynardine can travel between different dimensions and universes and cross over different planes of existence or travel across various forms of reality. ║Reynardine can create/generate a Nexus Point, a dimensional hub that either leads to and/or is connected to various realities and acts sort of like a dimensional oasis or anchor point for those realities, This Dimensional Hub is the Mysterious Tower he Occupies, although he didn't Create the tower its self he did use this power on it. ║Reynardine can link/sync alternate/parallel realities to his own home reality/universe, in this Case the Mysterious Tower, allowing the Dimensional worlds Contained with into experience the same passage of time, seasons, distance between locations, etc. as the world its Connected to. Since different realities have different time frame rates, such as being either faster or slower then their own world, this would prevent the various time discrepancies from negatively effecting a character after they enter or leave the alternate reality. ║Reynardine can mimic/replicate skills, powers, attacks, movements, etc. of others in superior way compared to target they copied the skill/power/movement/attack from. he does however have a time-limit for how long the powers/skills/attacks/movements are retained, may only mimic one target at a time and must at least wait a minute before mimicking another target. ║Reynardine is capable of hiding numerous weaponry items, weapons or objects, even things that have much bigger than his own body. With talents such as this the user is skilled with using any of the hidden weapons. The weapons are often hidden within a very small item at times and may not appear to heavy for the user to carry, Typically his Hidden Arsenal of weapons are... quite unorthadox. ║User is a Trickster: a god, goddess, spirit, man, woman, or anthropomorphic animal who plays tricks or otherwise disobeys normal rules and conventional behavior. The Trickster openly questions and mocks authority, encourages impulse and enthusiasm, seeks out new ideas and experiences, destroys convention and complacency, and promotes chaos and unrest. At the same time, the trickster brings new knowledge and wisdom. Even when punished horribly for their effrontery, their indomitable spirit (or sheer foolishness) keeps them coming back for more. Tricksters can be anything from gods of chaos, bedeviling heroes for a few laughs, to master manipulators who use cruel ploys and sadistic choices. They can also be heroes (or more likely anti-heroes) who make up for a lack of strength or bravery with manipulation, planning, or outright cheating. The trickster is often a master of disguise and may have magical powers. ║Reynardine can create, shape, manipulate, and distort/warp domains (personal or otherwise); a realm/space, dimension, plane, reality or specific sphere of influence either belonging to or owned by or was once owned by others, himself, anyone or anything. Allowing the him to decide, destroy and manipulate both personal domains and even their hubs/sources as well as any other existing type of domain/sphere of influence, even granting them the power to subvert the authority of the targets domain and destroy it if they wish, This is particularly used with in the Tower when he doesn't approve of other Dimensions being brought into existence or opened with in his Domain. ║ Renard can create, shape and manipulate physical aspects of space within an area of his choosing, including an area and whatever is inside of that area. he can trap subjects or objects in space and push that space, throwing subject and object away from him or to create wormholes, paradoxes, and other strange events by warping spatial areas and twisting them around. ║Regarded as being Renard's Signature Skill by those who know of his existence and capability's, This power, Self named "Novelty Chance Random" by Renard allows him to perform a totally random and unethical attack or effect that can either mock his enemies just for the fun of it or bring harm upon them, the out come an Result can not be predicted and is even unknown to Renard himself, results of this power vanish quickly soon after use. ║This is regarded as Reynardine's Second Signature skill, with it he can create and/or uses specialized magical weapons that have a variety of functions, It is warned and generally by him that these weapons should be taken Seriously no matter how ridiculous they may appear as they are in fact No Joke even if they are used as one. ║Regarded as being Reynardines Third Signature Skill, When Swinging novelty/gimmick weapons like inflatable objects or roll's of paper like a weapon, they release a explosive blast of kinetic energy that inflicts no physical damage on impact but does propel/launch the hit target/item, if the used tool is inflatable and it pops on impact both party's can be launched in opposed directions if they are unable to endure or anchor them selves at the time, the bigger the tool the more power behind the Kinetic Blast, how ever its a given that Reynard will always be blown away when this happens. ╠■►!!! Dangerously Unpredictable, Caution Advised !!! ╠■►Main Combat ability's are regarded as being usually Harmless. ╠■►Likes to Stay in-control of Situations, becomes Desperate when not. ╠■►Will always try and Show off or make a Grand Show of things. ╠■►only Fights when Directly Challenged. ╠■►Prefers to Bend and Warp Reality First. ╠■►Becomes Embarrassed and annoyed when Ears and/or Tail are no longer hidden. ╠■►Vulnerable to negation magic/powers depending on the users level. ╠■►Signature Skills often backfire when used. ╠■►His Physical being is rather weak. ╠■►"Its Party Time, P, A, R,T....Y? Because I Gotta!" ╠■►"What's In The Box? What Are You Asking Me For? Not Even I Know That!. " ╠■►"How Do You Fight What You Cant Predict?... Im Still Trying To Figure That Out My Self." ╠■►"That's Not Mine I Swear..."
╠■►"Who Knows What I Might Find In My Pockets... Not That I Want To Know..."
╠■►"Yes I Have A Trick Up My Sleeve... Want To See It?" ╠■►"Have I Got A Trick Up My Sleeve?... Wouldn't You Like To Know..."
╠■►"Want To See My Trump-Card?... ... Its exactly As It Sounds..."
╠■►"Prey To Any God You Like... But Not Even Lady Luck Can Change The Misfortune I Bring!" ╠■►"Expect Low Odd's of Luck With a Heavy Shower of Random Results In Today's Forecast Change." ╠■►"What where you Expecting something more?." ╠■►"have you Met the others? no, shame, im sure they would all have loved to meet you." ╠■►"yeah i can name a few, Anansi, Kuma, Sun, Bacchus, Hermes, Kitsune, Coyote, Loki and John."